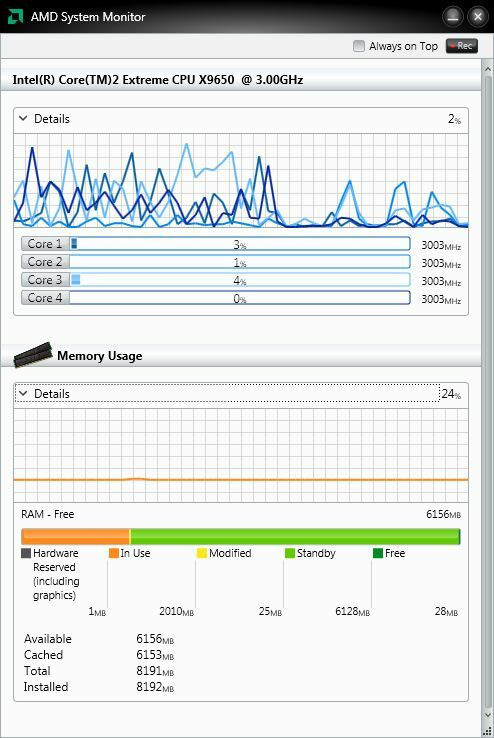 AMD System Monitor (or ASM) is a new system utility that monitors the utilization of the processor (CPU), graphic card (GPU) and system memory. It’s a useful tool to illustrate the different workloads of the CPU and GPU at the same time. AMD System Monitor is designed to work with new APUs but also with all other processors like AMD Phenom or Athlon, Intel CPUs and AMD Radeon GPUs (no NVIDIA GPU support!). With today’s changing workloads, our partners and customers were looking for a utility which could capture the inclusive nature of AMD’s new APUs, and depict the balance between GPU and x86 loads. AMD System Monitor includes an option to record information to an xml when running other applications/games and is able to record CPU utilization, CPU frequency (including boost frequency), GPU utilization and GPU frequency. You can download it here: AMD System Monitor homepage. It seems to have a visual bug, almost all the time it goes to one color of the textures. Ok I found the solution, it does not work with RadeonPro, i make a profile and disable api monitoring / auto, and all works fine. Nvidia gpus should be supported as well. I think it doesn’t fully work with XP because it shows me only the GPU(HD5770),my Athlon II 250 is not shown.